Advanced Dungeons & Dragons toys were released in 1983 by LJN, and they were about to find out if there was a toy market for toys based on the ever popular Dungeons & Dragons RPG game! The figures averaged at the now common 3 3/4" height and they also had a 5" inch figure series. LJN produced these figures with extreme quality, detail, poseability, color, and even gave some a slew of weapons! They really put a full effort into this line, and they even created the Battle-Mattic action for the figures! This is where the figure has a lever on his back and you push it and their arm swings. The figures themselves ranged from all sorts of characters. There were Humans, Mystic Knights, Ogre's, Elves, Sorcerers, Orcs, Paladins, Barbarians and Dwarf's. Accompanying these figures were the monsters & creatures, which included some horses, dragons, half beasts, and even the 5-headed Dragon Timat! In total, 22 different figures, 7 creatures and 1 playset were produced. There were many figures & monsters and even a playset that were held back and ended up never being produced. Many side figure toy lines were made. One of which is a small 1" inch PVC line. Another line created was the Power Creature Wind-Ups. Though 3 were advertised being sold, it seems only the Cave Fisher was produced. This figure seems to be the rarest of all D&D toys produced. LJN also produced a whole other series of Advanced Dungeons & Dragons. These figures were all PVC, and well detailed and colored. These PVC's were more based on the RPG gaming characters and monsters. 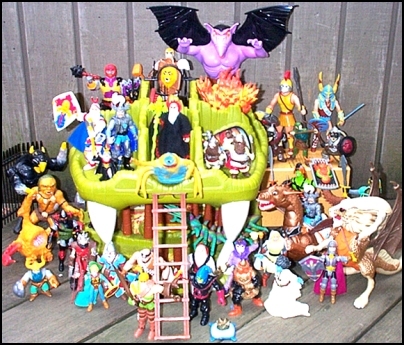 Though the Action figure line did have some characters and monster appearing both in the RPG, and also in the CBS Cartoon Series. The PVC's were of characters like Bullywogs of the Bog, Fire Elemental, Odious Ogre and the Grell. Many Humans, Dwarf, and Elves figures were produced as well. Some monsters were also poseable with wires inside them, like the Chimera. There are over 45+ Advanced Dungeons & Dragons PVC figures produced and work well with the main Action Figure series. Overall, the Advanced Dungeons & Dragons toys are one of the largest action figure series of the 80's. The series also provides the collector with many rare and unusual pieces, as well as many variants. Variants such as the card backers from 1st and 2nd series, and even the Purple and Red background colors they switched around with in 2nd series. The figures also have variants such as the 1st series reissues in 2nd series with battle-mattic actions. For a collector of the 80's, this is a good toy line to start out with. And who knows of it's future market values, with the new Advanced Dungeons & Dragons movie coming out!